In this tutorial, you’ll learn what a CALayer is, and see 10 examples of using CALayers for cool effects, like shapes, gradients, and even particle systems. Update note: This tutorial has been updated to iOS 11, Swift 4, and Xcode 9 by Michael Ciurus. The original tutorial was written by Scott Gardner. As you probably know, everything you see in an iOS app is a view. There’s button views, table views, slider views, and even parent views that contain other views. But what you might not know is that each view in iOS is backed by another class called a layer – a CALayer to be specific. In this article, you’ll learn what a CALayer is and how it works. You’ll also see 10 examples of using CALayers for cool effects, like shapes, gradients, and even particle systems. This article assumes you’re familiar with the basics of iOS app development and Swift, including constructing your UI with storyboards. Note: If you’re not quite there, no worries. You’ll be happy to know we have quite a few tutorials and books on the subject, such as Learn to Code iOS Apps with Swift and The iOS Apprentice. How does CALayer relate to UIView? UIView takes care of many things including layout or handling touch events. It’s interesting to notice that it doesn’t directly take care of the drawing or animations, UIKit delegates that task to its brother: CoreAnimation. UIView is in fact just a wrapper over CALayer. When you set bounds on a UIView, the view simply sets bounds on its backing CALayer. If you call layoutIfNeeded on a UIView, the call gets forwarded to the root CALayer. 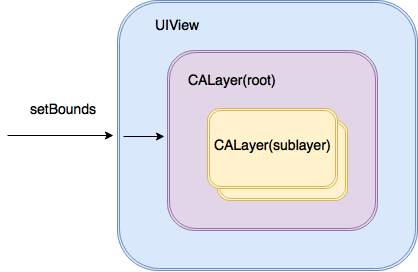 Each UIView has one root CALayer, which can contain sublayers. The easiest way to understand what layers are is to see them in action. You’ll start with a simple starter project to play around with layers. 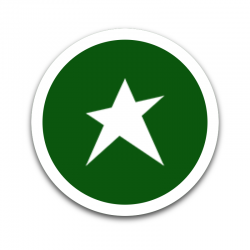 Download this simple project which is just a single view app with a view inserted in the center. @IBOutlet weak var viewForLayer: UIView! As mentioned earlier, every view in iOS has a layer associated with it, and you can retrieve that layer with .layer. The first thing this code does is create a computed property called layer to access the viewForLayer‘s layer. Pretty cool effect with just a few lines of code, eh? And again – since every view is backed by a layer, you can do this kind of thing for any view in your app. Changed the layer’s background color from its default of no background color to blue. Given it a border by changing its border width from the default 0 to 100. Changed its color from the default black to red. 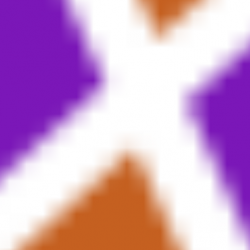 And, lastly, given it a shadow by changing its shadow opacity from default zero (transparent) to 0.7. This alone would cause a shadow to display, and you took it a step further by increasing its shadow radius from its default value of 3 to 10. 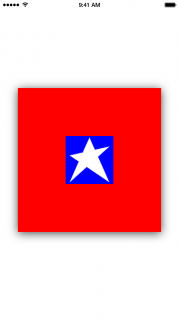 The contents property on a CALayer allows you to set the layer’s content to an image, so you set it to an image named “star” here. The image has been shipped with the starter project. 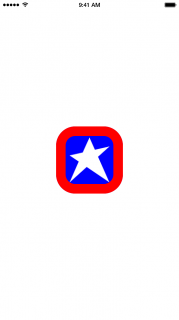 Notice how the star is centered – this is because you set the contentsGravity property to kCAGravityCenter. As you might expect, you can also change the gravity to top, top-right, right, bottom-right, bottom, bottom-left, left and top-left. 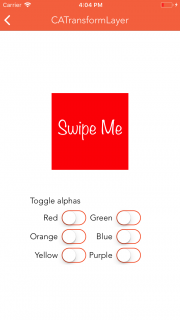 The starter project contains connected tap and pinch gesture recognizers. 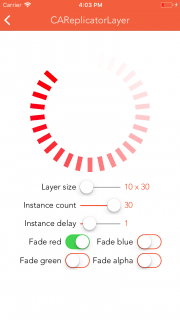 This tells the viewForLayer layer to toggle its layer’s shadow opacity between 0.7 and 0 when the view recognizes a tap. The view, you say? Well, yes. You could override CALayer‘s hitTest(_:) to do the same thing, and actually you’ll see that approach later in this article. But hit testing is all a layer can do because it cannot react to recognized gestures. That’s why you set up the tap gesture recognizer on the view. Here you're creating a positive or negative offset based on the user's pinch, and then adjusting the size of the layer's frame, width of its border and the border's corner radius. A layer's corner radius is 0 by default, meaning it's a standard rectangle with 90-degree corners. Increasing the radius creates rounded corners. Want to turn a square layer into a circle? Set its corner radius to half of its width. Note that adjusting the corner radius doesn't clip the layer's contents (the star image) unless the layer's masksToBounds property is set to true. 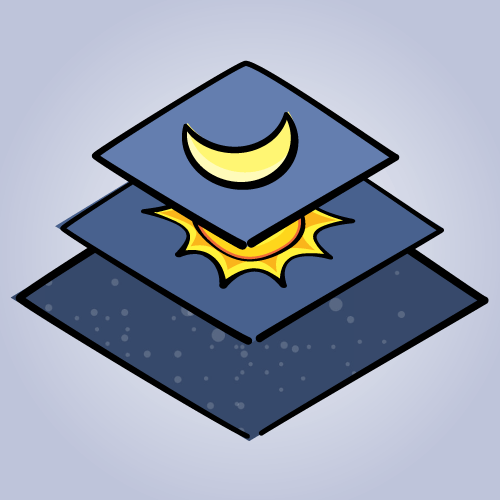 CALayer has more than just a few properties and methods to tinker with, as well as several subclasses that have unique properties and methods. What better way to get an overview of all this great API than by taking a guided tour, raywenderlich.com-style? You've already seen an example of using CALayer, and setting a few of the properties. Layers can have sublayers. Just like views can have subviews, layers can have sublayers. You can use this for some cool effects! Layer properties are animated. When you change the property of a layer, it is animated over time by default. You can also customize this animation behavior to your own timing. Layers are lightweight. Layers are lighter-weight than views, and therefore they help you achieve better performance. Layers have tons of useful properties. You've seen a few already, but let's take a look at a few more! You'll take a tour of the full list of CALayer properties - some you haven't seen yet, and are quite handy! As previously seen, this creates a CALayer instance and sets it to the bounds of someView. Then sets an image as the layer's contents and centers it within the layer. 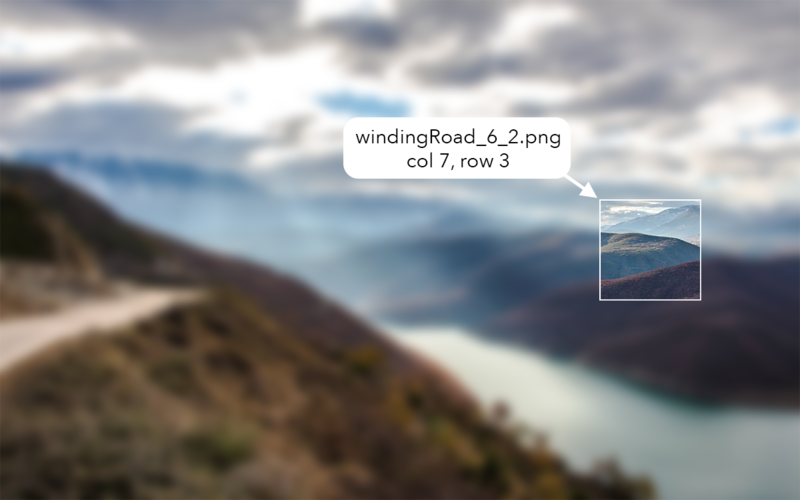 Notice that the underlying Quartz image data (CGImage) is assigned. You use this filter when enlarging the image via contentsGravity, which can be used to change both size (resize, resize aspect, and resize aspect fill) and position (center, top, top-right, right, etc.). You set the background color to Ray's favorite shade of green :] That makes the layer opaque and visible. At the same time, you tell the layer to not mask its contents, which means that if its size is smaller than its contents (the star image), the image will not be clipped. The layer's corner radius is set to half the width of the layer to create visuals of a circle with a border; notice that layer colors are assigned as the Quartz color references (CGColor). You create a shadow and set shouldRasterize to true (discussed below), and then add the layer to the view hierarchy. CALayer has two additional properties that can improve performance: shouldRasterize and drawsAsynchronously. shouldRasterize is false by default, and when set to true it can improve performance because a layer's contents only need to be rendered once. 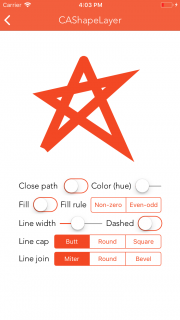 It's perfect for objects that are animated around the screen but don't change in appearance. A Word of Caution: Consider the implications before setting either shouldRasterize or drawsAsynchronously. Compare the performance between true and false so you know if activating these features actually improves performance. When misused, performance is likely to take a nosedive. Play around with the various controls - it's a great way to get a feel of what you can do with CALayer! Note: Layers are not part of the responder chain so they won't directly react to touches or gestures like views can, as you saw in the CALayerPlayground example. However, you can hit test them, as you'll see in the example code for CATransformLayer. You can also add custom animations to layers, which you'll see when you get to CAReplicatorLayer. UIScrollView doesn't use a CAScrollLayer to do its work, instead it directly changes its layer's bounds. A computed property is used to return the underlying CAScrollLayer layer of the scrollingView. Scrolling is initially set to both horizontal and vertical. When a pan is recognized, a new point is created and the scrolling layer scrolls to that point inside a UIView animation. Note that scroll(to:) doesn't animate automatically. 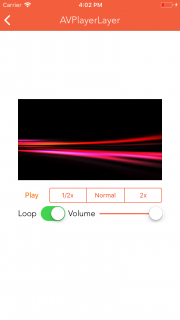 Layer Player includes two controls to lock scrolling horizontally and vertically. If you want something lightweight and only need to programmatically scroll, consider using CAScrollLayer. 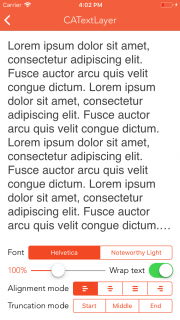 If you want the user to be able to scroll, you're probably better off with UIScrollView. To learn more, check out our 18-part video tutorial series on this. If you are scrolling a very large image, consider using CATiledLayer (more below). CATextLayer provides simple but fast rendering of plain text or attributed strings. Unlike UILabel, a CATextLayer cannot have an assigned UIFont, only a CTFontRef or CGFontRef. Creates a CATextLayer instance and sets its to someView's bounds. Creates a string of repeated text and assigns it to the text layer. 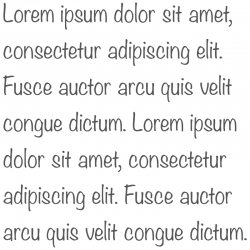 Creates a font and assigns it to the text layer. Sets the text layer to wrap and left-align, (you have the option of setting it to natural, right, center and justified) and matches its contentsScale to the screen, and then adds the layer to the view hierarchy. All layer classes, not just CATextLayer, render at a scale factor of 1 by default. When attached to views, layers automatically have their contentsScale set to the appropriate scale factor for the current screen. You need to set the contentsScale explicitly for layers you create manually, or else their scale factor will be 1 and you'll have pixelation on retina displays. Creates a new player layer and sets its frame. Creates a player with an AV asset. Tells the player to do nothing when it finishes playing; additional options include pausing or advancing to the next asset, if applicable. Registers for AVPlayer's notification when it finishes playing an asset (and remove the controller as an observer in deinit). Next, when the play button is tapped, it toggles controls to play the AV asset and set the button's title. Then move the playback cursor to the beginning when the player has reached the end. Note this is just a simple example to get you started. In a real project, it would generally not be advisable to pivot on a button's title text. videoGravity sets the resizing behavior of the video display. isReadyForDisplay checks if the video is ready for display. AVPlayer, on the other hand, has quite a few additional properties and methods. One to note is rate, which is the playback rate from 0 to 1. Zero means to pause, and 1 means the video plays at regular speed (1x). However, setting rate also instructs playback to commence at that rate. In other words, calling pause() and setting rate to 0 does the same thing, as calling play() and setting rate to 1. So what about fast forward, slow motion or playing in reverse? AVPlayer has you covered. Setting rate to anything higher than 1 is equivalent to asking the player to commence playback at that number times regular speed, for instance, setting rate to 2 means double-speed. As you might assume, setting rate to a negative number instructs playback to commence at that number times regular speed in reverse. 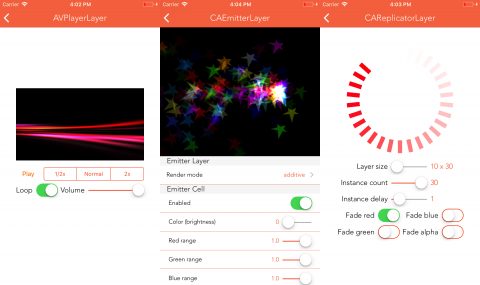 CAGradientLayer makes it easy to blend two or more colors together, making it especially well suited to backgrounds. To configure it, you assign an array of CGColors, as well as a startPoint and an endPoint to specify where the gradient layer should begin and end. Bear in mind, startPoint and endPoint are not explicit points. Rather, they are defined in the unit coordinate space and then mapped to the layer's bounds when drawn. In other words, an x value of 1 means the point is at the right edge of the layer, and a y value of 1 means the point is at the bottom edge of the layer. 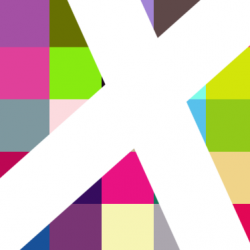 CAGradientLayer has a type property, although kCAGradientLayerAxial is the only option, and it transitions through each color in the array linearly. Alternatively, you can control the locations property with an array of values between 0 and 1 that specify relative stops where the gradient layer should use the next color in the colors array. CAReplicatorLayer duplicates a layer a specified number of times, which allows you to create some cool effects. First, create an instance of CAReplicatorLayer and set its frame to someView's bounds. Next, set the replicator layer's number of copies (instanceCount) and drawing delay. Also set the replicator layer to be 2D (preservesDepth = false) and its instance color to white. Then, add red/green/blue offsets to the color values of each successive replicated instance. Each defaults to 0, and that effectively preserves color value across all instances. 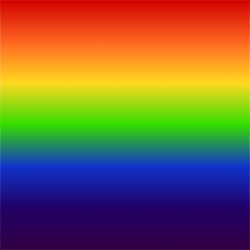 However, in this case, the instance color was originally set to white, meaning red, green and blue are 1.0 already. Hence, setting red to 0 and the green and blue offset values to a negative number allows red to be the prominent color. Similarly, add the alpha offset to the alpha of each successive replicated instance. After that, create a transform to rotate each successive instance around a circle. Then create an instance layer for the replicator layer to use and set its frame so the first instance will be drawn at center x and at the top of someView's bounds. Also, set the instance's color and add the instance layer to the replicator layer. Now, make a fade animation to animate opacity from 1 (opaque) to 0 (transparent). And, finally, set the instance layer's opacity to 0 so that it's transparent until each instance is drawn and its color and alpha values are set. 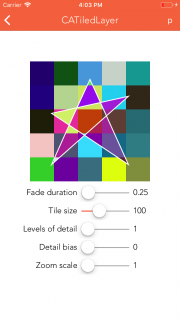 CATiledLayer asynchronously draws layer content in tiles. This is great for very large images or other sets of content where you are only looking at small bits at a time, because you can start seeing your content without having to load it all into memory. @IBOutlet weak var tiledBackgroundView: TiledBackgroundView! layerClass is overridden so the layer for this view is created as an instance of CATiledLayer. 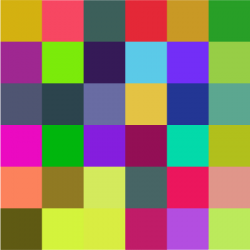 Seeds the rand48() function that will be used to generate random colors in draw(_:). Then scales the contents of the layer (cast as a CATiledLayer) to match the screen's scale and its tile size set. Overrides draw(_:) to fill the view with tiled layers with random colors. This blurriness is the result of levels of detail maintained by the layer. CATiledLayer has two properties, levelsOfDetail and levelsOfDetailBias. levelsOfDetail, as its name aptly applies, is the number of levels of detail maintained by the layer. It defaults to 1, and each incremental level caches at half the resolution of the previous level. The maximum levelsOfDetail value for a layer is that on which its bottom-most level of detail has at least one pixel. 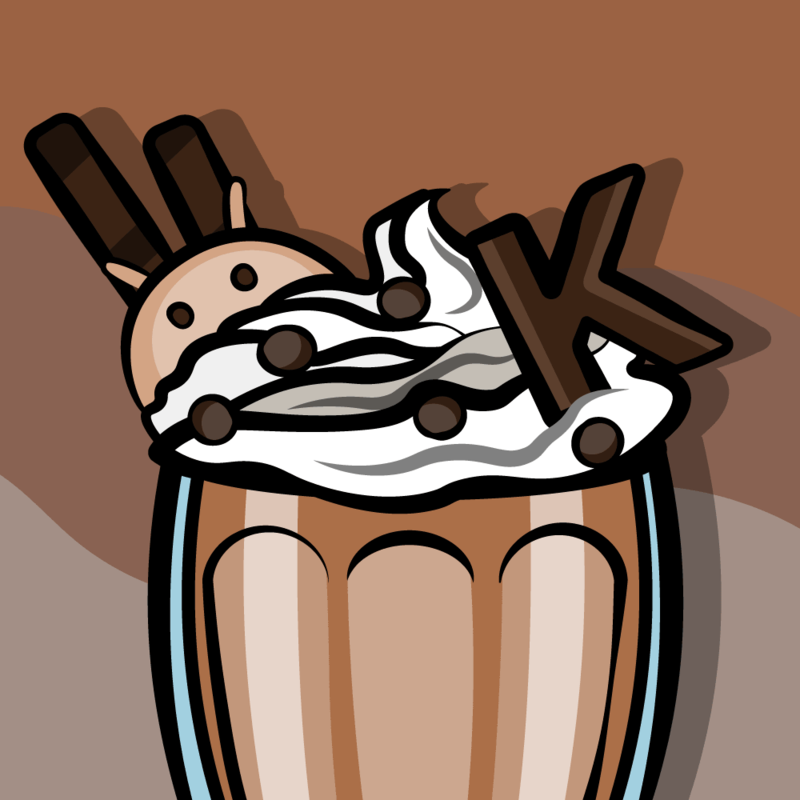 levelsOfDetailBias, on the other hand, is the number of magnified levels of detail cached by this layer. It defaults to 0, meaning no additional magnified levels will be cached, and each incremental level will be cached at double the preceding level's resolution. Pretty cool, eh? But wait, there's more! CATiledLayer has another useful purpose: asynchronously drawing tiles of a very large image, for example, within a scroll view. You have to provide the tiles and logic to tell the tiled layer which tiles to grab as the user scrolls around, but the performance gain here is remarkable. 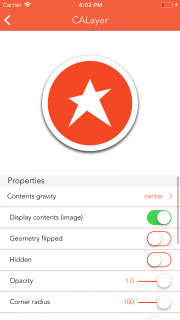 Layer Player includes a UIImage extension in a file named UIImage+TileCutter.swift. Fellow iOS colleague Nick Lockwood adapted this code for his Terminal app, which he provided in his excellent book, iOS Core Animation: Advanced Techniques. Creates properties for the length of the tile side, base image filename, and the path to the caches directory where the TileCutter extension saves tiles. Overrides layerClass to return CATiledLayer. Implements init(coder:), in the view's layer, casts it as a tiled layer and sets its tile size. Note that it is not necessary to match contentsScale to the screen scale, because you're working with the backing layer of the view directly. Next, override draw(_:) to draw each tile according to its column and row position. Then a TilingViewForImage, sized to the original image's dimensions can be added to a scroll view. CAShapeLayer makes use of scalable vector paths to draw, and it's much faster than using images. Another part of the win here is that you'll no longer need to provide images at regular, @2x and @3x sizes. w00t! First, create the color, path, and shape layer. @IBOutlet weak var someView: UIView! Next, draw the shape layer's path. You do this by drawing from point to point using methods like move(to:) or addLine(to:). If writing this sort of boilerplate drawing code is not your cup of tea, check out PaintCode; it generates the code for you by letting you draw using intuitive visual controls or import existing vector (SVG) or Photoshop (PSD) files. Set its path to the path drawn above, its fill color to the color created in step 1, and set the fill rule explicitly to the default value of non-zero. The only other option is even-odd, and for this shape that has no intersecting paths the fill rule makes little difference. The non-zero rule counts left-to-right paths as +1 and right-to-left paths as -1; it adds up all values for paths and if the total is greater than 0, it fills the shape(s) formed by the paths. Essentially, non-zero fills all points inside the shape. The even-odd rule counts the total number of path crossings that form a shape and if the count is odd, that shape is filled. This is definitely a case when a picture is worth a thousand words. 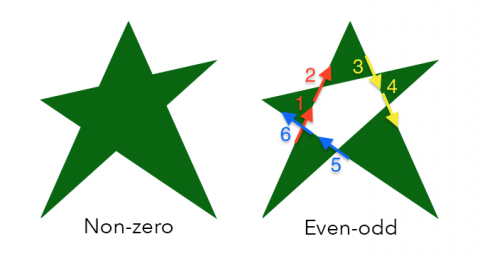 The number of path crossings in the even-odd diagram that form the pentagon shape is even, so the pentagon is not filled, whereas the number path crossings that form each triangle is odd, so the triangles are filled. Finally, call the path drawing and layer set up code, and then it add the layer to the view hierarchy. 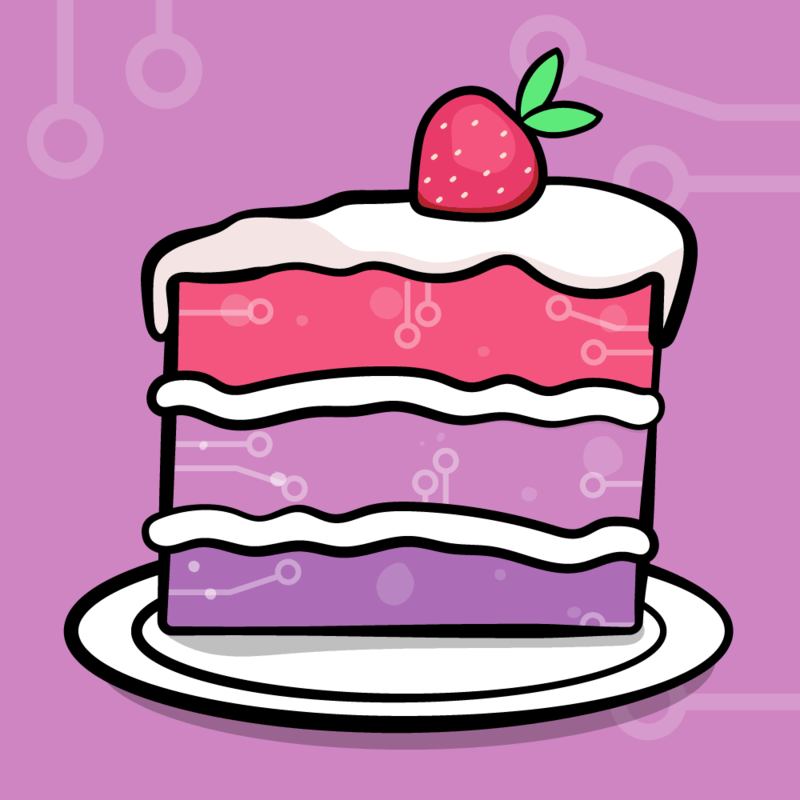 Note: You may notice that we're skipping over the next demo in the Layer Player app. This is because CAEAGLLayer is effectively obsoleted by CAMetalLayer, which debuted with iOS 8 alongside the Metal framework. 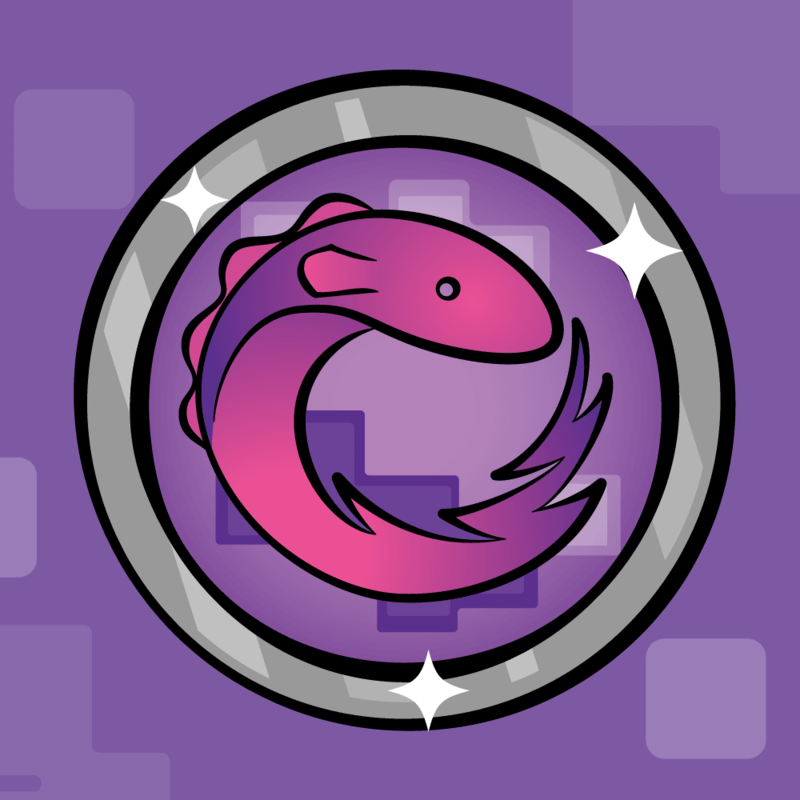 You can find a great tutorial covering CAMetalLayer here. CATransformLayer does not flatten its sublayer hierarchy like other layer classes, so it's handy for drawing 3D structures. It's actually a container for its sublayers, and each sublayer can have its own transforms and opacity changes, however, it ignores changes to other rendered layer properties such as border width and color. 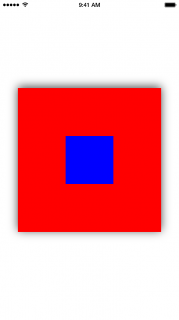 First create properties for the side length, colors for each side of the cube, and a transform layer. Then build a cube by creating, rotating and then adding each side to the transform layer. 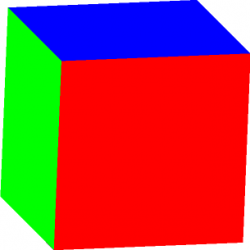 Then set the transform layer's z axis anchor point, rotate the cube and add the cube to the view hierarchy. Next write a function that applies a rotation based on specified x and y offsets. Notice that the code sets the transform to sublayerTransform, and that applies to the sublayers of the transform layer. Then observe touches and cycle through the sublayers of the transform layer. Hit test each one and break out as soon as a hit is detected, since there are no benefits to hit testing remaining layers. Finally, set up the transform layer and add it to the view hierarchy. Note: So what's with all those currentTransform.m##s? I'm glad you asked, sort of :]. These are CATransform3D properties that represent elements of a matrix that comprises a rectangular array of rows and columns. To learn more about matrix transformations like those used in this example, check out 3DTransformFun project by fellow tutorial team member Rich Turton and Enter The Matrix project by Mark Pospesel. Now, try something: tap anywhere on the cube and "Transform layer tapped!" will print to the console. Creates an emitter layer and cell. Provides a seed for the layer's random number generator that in turn randomizes certain properties of the layer's emitter cells, such as velocity. This is further explained in the next comment. 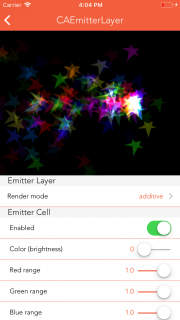 Renders emitter cells above the layer's background color and border in an order specified by renderMode. Sets drawsAsynchronously to true, which may improve performance because the emitter layer must continuously redraw its emitter cells. Next, the emitter position is set via a helper method. This is a good case study for how setting drawsAsynchronously to true has a positive effect on performance and smoothness of animation. Next, set up the emitter cell:. It sets up the emitter cell by setting its contents to an image (this image is available in the Layer Player project). Then it specifies an initial velocity and max variance (velocityRange); the emitter layer uses the aforementioned seed to create a random number generator that randomizes values within the range (initial value +/- the range value). This randomization happens for any properties ending in Range. The color is set to black to allow the variance (discussed below) to vary from the default of white, because white results in overly bright particles. 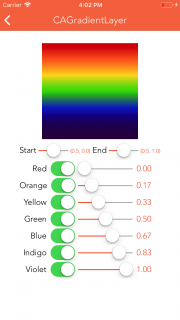 A series of color ranges are set next, using the same randomization as for velocityRange, this time to specify the range of variance to each color. Speed values dictate how quickly each color can change over the lifetime of the cell. Next, block three specifies how to distribute the cells around a full circular cone. More detail: It sets the emitter cell's spinning velocity and emission range. Furthermore, emission range determines how emitter cells are distributed around a cone that is defined by the emissionRange specified in radians. Sets the cell's lifetime to 1 second. This property's default value is 0, so if you don't explicitly set this, your cells never appear! Same goes for birthRate (per second); the default is 0, so this must be set to some positive number in order for cells to appear. Lastly, cell x and y acceleration are set; these values affect the visual angle to which the particles emit. Next, there are helper methods to convert degrees to radians and to set the emitter cell position to the midpoint of the view. Then set up the emitter layer and cell, and add that cell to the layer, and the layer to the view hierarchy. Congratulations! You have completed the great CALayer Tour, and have seen 10 examples of how to use CALayer and its many subclasses. You can download the LayerPlayer project here, and you can download the completed first project here. As always, if you have any questions or comments about this article or working with layers, join in on the discussion below!